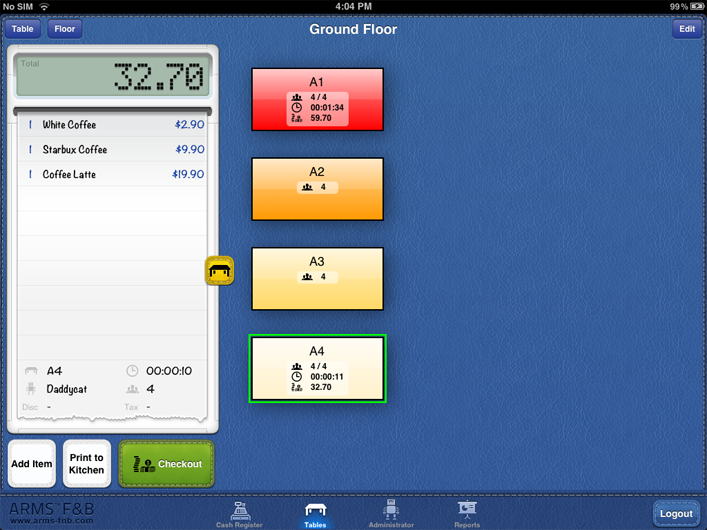 ARMS® F&B is Point of Sale for iPad / iPhone design for the Restaurant environment. It is fully standalone and does not require a back end server to operate. You can now download ARMS® F&B for trial and upgrade to full version if you like it. Just install the application and you can start taking orders. 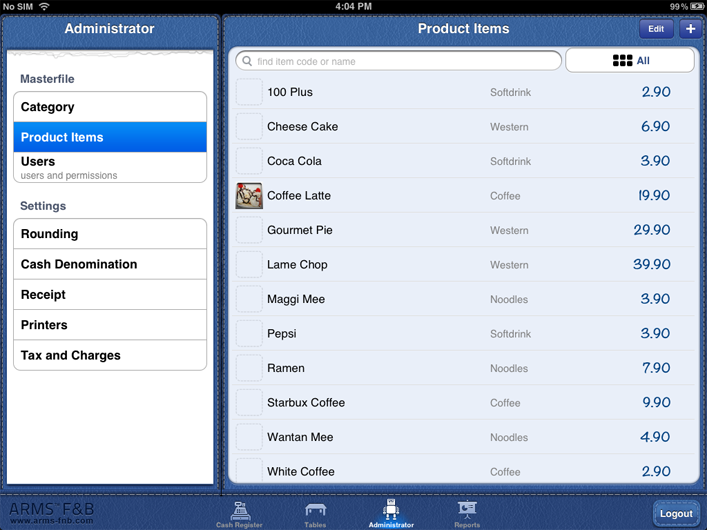 Now you can make use of iPod Touch, iPhone 3GS/4/4s/5, iPad 1, 2 and The New iPad to take order from your customers. Impress your customer from the moment you start taking an order. Conventional F&B software is too complicated for modern days, and you do want to suffer from that. We focus on making it powerful, simple, affordable, and user friendly. We take away the bells and whistles, and keep things simplified, yet beautifully designed. And the best part is, there is no server or PC needed, it is fully standalone -- everything runs in your iPad. ARMS® F&B makes it easy for you to manage your restaurant, let you know more about your customers and keep them coming back. Setup ARMS® for your restaurant and the operation will run like what you’ve set, manage has never been so easy before. You only need a few minutes to put everything in and make them under control. Sustainable business starts here, now you can get a snapshot of your business data right from your iPad, ARMS® featured with professional reports for you to further analyze your business. ARMS® F&B have all the features you want and need for day to day business operation, including those that you don’t even know you need it. Snap photo instantly and become your product thumbnali. Shortcuts for customize favorite items. Split / Merge table and bills. Print to multiple bar & kitchen printers. Daily/Monthly sales and collection reports. 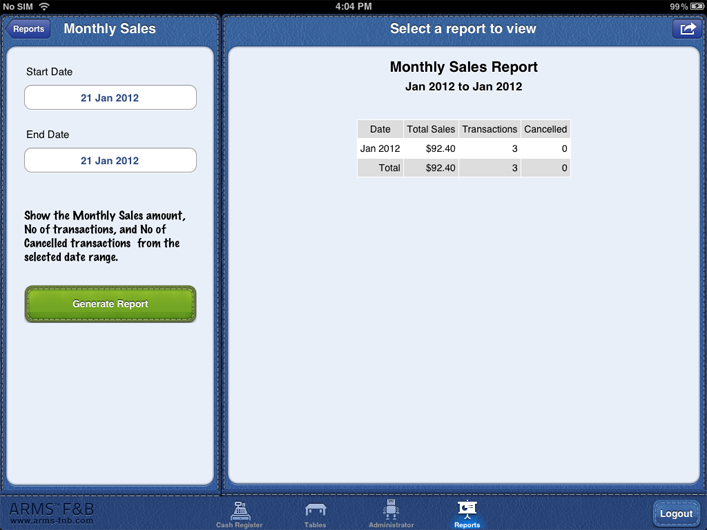 Reports generated in HTML and email directly from system. Multiple-User with individual privilege setting. Customizable rounding adjustment tax, and charges. Mobile technology helps waiter/waitress to save time, reduce movement and increase accuracy. 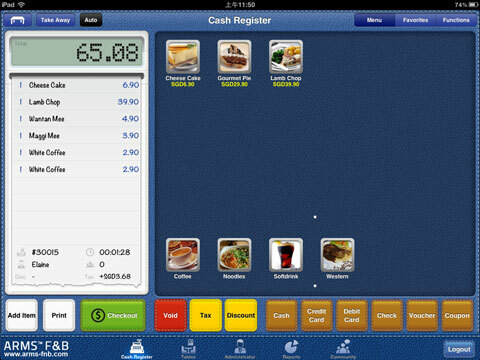 Ultimately, it helps restaurant owner to save up labor and operation cost. Customer experience is what business owner always looking at improving. How you deliver a peaceful, joyful and wonderful environment for your customer? To achieve that, you need to have total control over your restaurant traffic and accuracy, ARMS® F&B Mobile Terminal can help you to achieve that. The wireless mobile terminal take order from one to another table swiftly and sending the order to both kitchen and bar for preparation immediately.